Human Rights mga panipi. "The universal aim is to achieve respect for the entire human race, not just for the dominant few.". 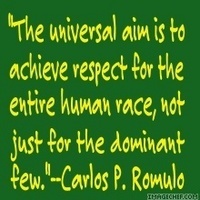 Images in the Human Rights club tagged: human rights human rights awareness month hram icons quotes carlos p romulo. mansanas HR Icon "Peace on Earth"
Human Rights mga panipi - Martin Luther King Jr.